While appliance recalls can be a serious concern for many homeowners, smaller recalls often do not get the same publicity as major recalls, leading to the possibility that some owners will be left unaware that their product has been recalled. Such may be the case with a recent recall of BlueStar and Big Chill gas ranges and ovens manufactured by Prizer-Painter Stove Works. However, it is critical that owners are made aware of this recall due to the hazard these units can pose. Here is everything you need to know about this recall if you or a loved one owns a BlueStar or Big Chill gas range or oven. On September 11, 2018, Prizer-Painter Stove Works announced a recall of about 7,000 BlueStar and Big Chill gas ranges and wall oven due to the fact that these units can pose a burn hazard. The manufacturer determined that use of the convection fan during the preheating or broiling sequence in the ovens can cause gas to ignite, which can pose a burn hazard to users when the oven door is opened. So far the manufacturer has received 51 reports of flames or flares due to delayed gas ignition, and seven incidents involving burns have been reported. The recall affects seven series of BlueStar and Big Chill free-standing ranges as well as one series of gas-powered wall ovens. The units affected were sold in a variety of colors at specialty appliance stores nationwide from May 2015 through October 2017 for between $3,000 and $18,000. 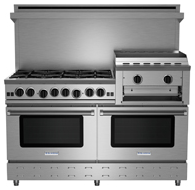 The BlueStar range series affected include the Culinary series, the Nova series, the Heritage Classic series, and the Precious Metals series (BlueStar wall ovens were also affected). The recall also affects the Big Chill Retro series, the Pro series, and the Classic series. A full list of recalled model numbers can be found here. If you suspect that your oven or range may be affected by this recall, it is critical that you immediately turn off the convection fan and do not use it. To be safe, you may want to consider not using the oven until it has been repaired. Your next step will be to contact Prizer-Painter Stove Works to find out about scheduling a free repair. While our experienced appliance repair technicians are well equipped to provide a variety of oven and range repair services, it is best to contact the manufacturer in the event of a recall. Contact us to learn more about this recall and the appliance repair services we provide.